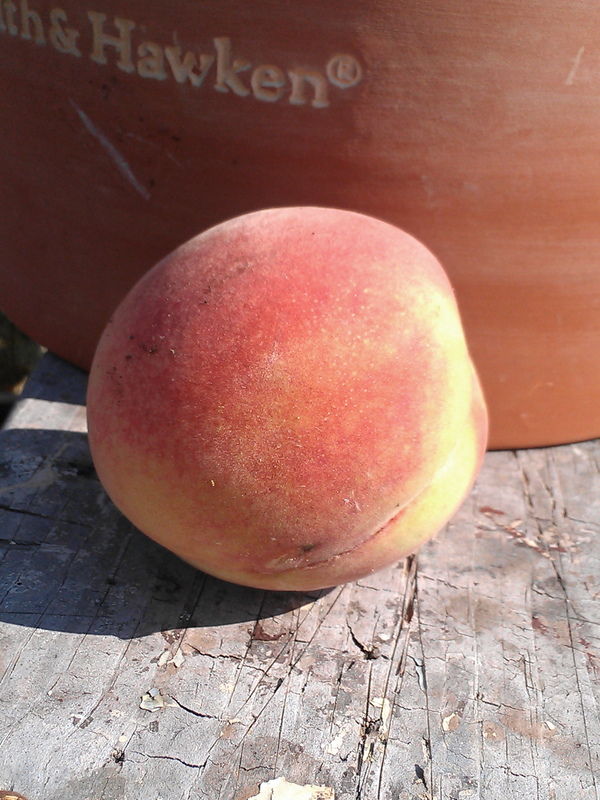 Since work is still super busy, I am pulling this draft out of the archives from peach season this summer. Hope you enjoy. These two recipes are delicious!!!!! One of our perfect white peaches from earlier in the summer. 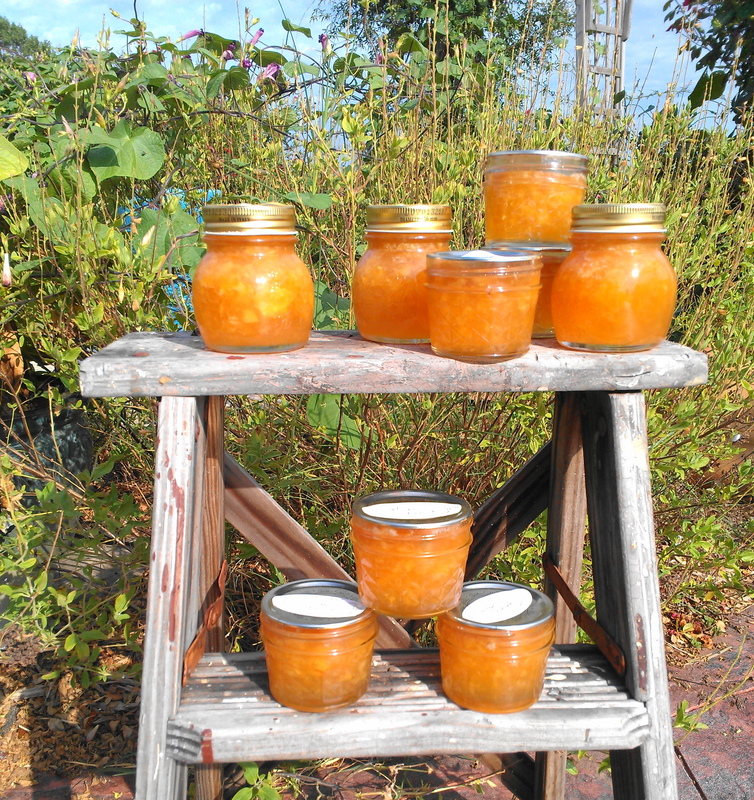 I used mostly white peaches with a few Red Havens thrown in for good measure. Place the peaches in a large stainless steel kettle. Mash with a potato masher until the desired consistency is obtained. Add lemon juice and liqueur. Whisk in pectin until dissolved and bring to a boil over high heat, stirring often. After the mixture comes to a boil, dump in sugar all at once. Boil hard, stirring constantly, for 1 minute. Remove from heat and skim off foam. Ladle hot jam into hot jars, leaving 1/4 inch headspace. Wipe rims, center lid on jar, and screw band down util it is fingertip-tight. This is a super easy freezer jam that also has the essence of ginger. 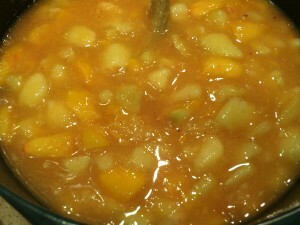 In a medium mixing bowl, combine sugar and pectin, whisking until well combined. 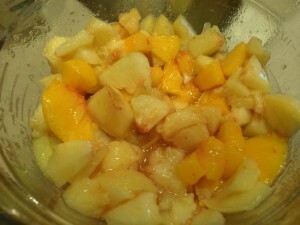 Add peaches, ginger, zest and lemon juice. Stir for three minutes so sugar will dissolve. Ladle into freezer jars and apply tight lids. Let jam stand at room temperature for about thirty minutes. Then, you can serve this immediately or refrigerate for up to three weeks or freeze for up to one year. OK—Have I been known to have freezer jam in my freezer for more than one year. Yes, I have. But, please follow these guidelines. I doubt I have this version in my freezer that long at all! Postscript: I also made Tomato Jam this weekend but used a Malbec instead of a white wine. Beautiful color and flavor! Ginger liqueur is something new to me. Did you make your own? Both versions have come out so wonderful. Nope. Bought it but you raise an interesting thought to make some. I have that same cookbook my friend. I love the combination of Ginger and peach. I love canning too. It is like keeping a bit of the summer in a jar. You can enjoy it well into winter. It is awesome, isn’t it???? The peaches balance it out. Save it for next summer! Geez your jam is intimidatingly beautiful. I love the outdoor shot on the ladder in the sun. That was very well done. I try to avoid jam, which is easy since I don’t eat a lot of toast, biscuits or muffins. Dang my life sounds boring—Ha. But I allow myself jam when I go out to breakfast. And you know that’s stupid, because the best jam is not in a restaurant. I do particularly love freezer jam. The essence of the fruit is still so piquant. The combo of ginger and peaches is phenomenal! Love it. So you know I’d love this jam. Terrific recipe — thanks. This ginger thing must have given this jam a big kick! The spoonfuls I licked from the jam kettles were tasty! I’ve had that book for years and cherish it! Lots of great recipes …. and how did I miss this one? Looks and sounds great. You are so right, this is a great book!!!! I will cherish it for years. I want that jam! (says in whiney voice) It looks so good. I need that book your bought you! Find the book cheap on amazon, get some peaches, make jam, no whininess needed. Love this combination of peaches and ginger. I think it would make a wonderful panini spread and would also be fabulous as an appetizer spooned over goat’s cheese or cream cheese. Ginger huh? This is different – but I love the peaches with it – I must try some. BTW, your cans look so beautiful – excellent work!! Ginger and Peaches – love that flavor!!! Both of these jams are winner. Be careful letting me know if you go out of town this fall. I might just race over and raid your freezer.